New York Mesothelioma attorneys discuss the two 'asbestos exposure in the workplace' cases recently joined by the Supreme Court. Two New York Mesothelioma/asbestos legal claims involving asbestos exposure in the workplace, filed by Levy Philips & Konigsberg, LLP, have been joined for trial based upon a recent legal court decision. On September 24, 2007, Justice Marcy S. Friedman, Supreme Court, New York County, located in downtown New York City, announced a ruling that joins the two mesothelioma cases, both being legal claims for mesothelioma/asbestos exposure in the workplace, for a single trial to begin on November 5, 2007. The Court's Order joins the cases of Joel and Sharon Rosenberg v. Alpha Wire Company, et. al, Index No. 106697/06 and Joseph and Dolores Casale, Index No. 104299/06. Mr. Rosenberg resided in Jackson, New Jersey when he developed pleural mesothelioma due to workplace asbestos exposure; he died from this asbestos cancer at the age of 64. Mr. Casale, who is living with pleural mesothelioma at the age of 65, resides in Lantana, Florida. Mesothelioma attorneys from Levy Phillips & Konigsberg LLP filed these legal claims regarding asbestos/mesothelioma in the New York City Asbestos Litigation, as each man suffered significant exposure to asbestos while working in New York City. Mr. Rosenberg, a life-long electrician with the International Brotherhood of Electrical Workers ("IBEW"), Local 3, started in the trade while still a teenager in 1960. Mr. Rosenberg's workplace asbestos exposure occurred while working in the electrician trade in work sites in New York. Mesothelioma due to workplace asbestos exposure developed in Mr. Rosenberg from a variety of worksites including the Arthur Kill Powerhouse in Staten Island, the World Trade Center, Kennedy Airport and Rockefeller Center. The asbestos/mesothelioma legal claim seeks money damages for Mr. Rosenberg's pain and suffering resulting from his mesothelioma. continues. Electricians, such as Mr. Rosenberg, sustained asbestos exposure in the workplace from a variety of sources including the cutting and splicing of wire and cable that was insulated with asbestos, as well as the drilling of asbestos-containing electrical control panels. Mr. Casale was a career steam fitter (also known as pipe fitter). At the time, steamfitters were unknowingly endangered with asbestos exposure in their workplace due to asbestos being used in boilers and other equipment. While still a teenager Mr. Casale worked at shipyards, including the Brooklyn Navy Yard, as a member of the Local 638 Union. Mr. Casale continued in the same union and worked in the steam fitter trade at job sites in New York City throughout the 1960s and 1970s. Mr. Casale later moved to Florida but due to his asbestos exposure in the workplace while still in New York, mesothelioma was diagnosed and immediately linked to his previous occupation. Mr. Casale's occupation caused his workplace asbestos exposure from equipment, including pumps, valves, and boilers, as well as from gaskets and insulation. Justice Friedman joined these two mesothelioma/asbestos legal claims into a single trial based upon New York Civil Practice Law and Rule ("CPLR") Section 602 which permits cases to be joined for trial to "avoid unnecessary costs or delay." The defendants in the lawsuit argued that the cases should be tried separately because Mr. Rosenberg and Mr. Casale worked in different trades and their claimed workplace asbestos exposure occurred at different job sites. But the New York mesothelioma attorneys from Levy Philips & Konigsberg, LLP, convinced the Court that these cases should be tried together to save costs and insure that each family received their day in court as soon as possible. The trial of these New York City mesothelioma/asbestos legal claims is expected to last approximately six weeks, and will feature the testimony of Mr. Casale, Mr. Rosenberg, their wives and children, along with a host of expert witnesses, with expertise in areas such as occupational medicine, history and public health. 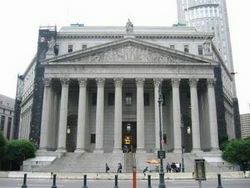 The trial will take place in Justice Friedman's courtroom located at 80 Centre Street in Manhattan. For more information about this mesothelioma trial, or for more information about mesothelioma in New York and New Jersey, asbestos exposure in the workplace or your rights regarding asbestos awareness at your jobsite you may call the mesothelioma attorneys at Levy, Phillips & Konigsberg LLP at 800-MESO-LAW or 212-605-6200 or complete the email form on this page. You will also find informative medical and asbestos/mesothelioma legal claim information for New York and New Jersey at http://www.nynjmesothelioma.com.